There are a number of factors that led us to the conclusion that the yellow dress is set to be the dress of the summer. First, of course, is Emma Stone's Iconic frock in La La Land. Then, there's the fact that yellow is Generation Z's colour (sorry, millennials, but pink is about to be usurped). During fashion week, we saw the hue everywhere, particularly in the form of one Tibi dress (pictured below) on numerous street stylers. Finally, we spotted a load of yellow dresses from other designers and the high street. Super cute. Wear with tan sandals and a basket bag. This is currently topping our wish list. We love the back detail. Style this with metallic mules and a bold red lip. This is your purse-friendly wedding guest option. The ruffle neckline on this linen midi dress is so pretty. Pair with cat eye shades. This will look just as chic with bare legs and trainers as it will with jeans and heels. Wear with sneakers for lazy brunches on Sunday afternoon. You'll feel like Monica Bellucci in this. The ruffles get us every time. Floral prints are still going strong. You can wear this alone with strappy heels or over a roll neck underneath with a pair of boots—a dress to cross the seasons. Don't fear the cutout dress. 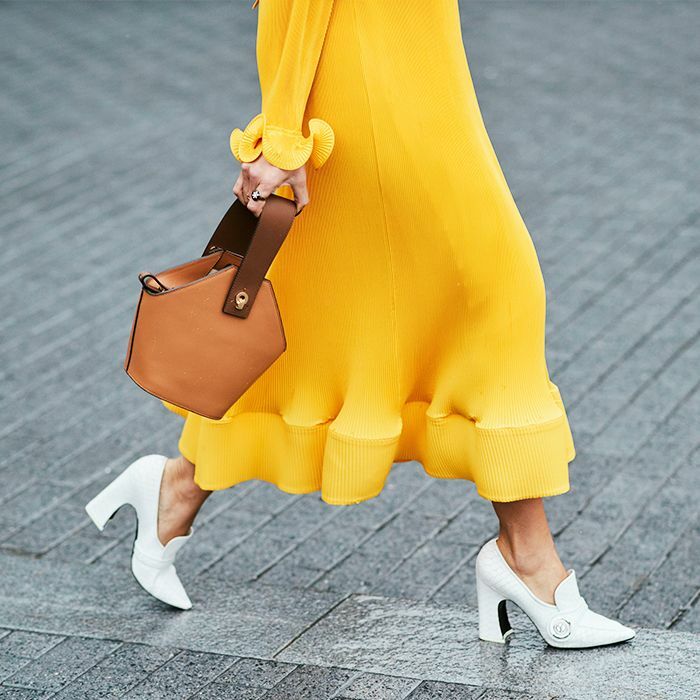 The dreamiest of yellow dresses. A solid yellow dress that says it's perfect for the office then drinks straight afterwards. For a subtler hint of hello, this Mademoiselle R pick is perfect. Want to see what this looks like on? Check out our guide to the most expensive-looking high-street pieces. Time to book a holiday on the Riviera. Just say your dress made you do it. Hard not to smile when seeing so much yellow, isn't it?